In Dutch oven or large saucepan, melt butter over medium-low heat. Add mushrooms; cook 8 to 10 minutes or until tender, stirring occasionally. Slowly add flour; cook and stir 2 to 3 minutes until flour mixture is combined with mushrooms. Whisk in vegetable broth until flour is mixed in and no lumps remain. Increase heat; bring to boil. Reduce heat; simmer, 5 minutes, stirring occasionally. Stir in bean salad, peas and corn. Cook 2 to 3 minutes or until heated through. Remove from heat; stir in milk, Parmesan cheese, sour cream, pepper and seasoned salt until cheese melts. Pour mixture into 2-quart casserole dish or 9 x 13-inch casserole dish sprayed with nonstick spray or lightly greased. Cut each biscuit dough round into 4 triangles. Top casserole with biscuit triangles. Bake 25 to 30 minutes, or until tops of biscuits are golden brown and vegetable mixture is bubbling. Allow to cool 15 minutes before serving. The filling will thicken as it cools. Sprinkle with parsley, if desired. Note: Recipe may be cut in half if fewer servings are desired. Nutrition information per serving (1/8 of recipe): 445 calories; 12g protein; 48g carbohydrate; 24g fat; 950mg sodium; 50mg cholesterol; 5g dietary fiber; 2.71mg iron; 0.19mg thiamin; 934.9IU vitamin A; 8.26mg vitamin C.
Makes 6 servings (approx. 2 cups each). Drain and rinse bean salad; set aside. Heat olive oil in a large pot on medium heat. Add onions and garlic with a pinch of salt and saute until translucent, about 3 to 4 minutes. Stir in dried herbs and black pepper. Cook until fragrant, about 1 minute. Add carrots, celery and zucchini with another pinch of salt. Cook, stirring occasionally, until vegetables are crisp tender, about 5 to 7 minutes. Stir in canned tomatoes. Add Parmesan rind, if using. Cook on medium heat about 10 minutes, until most of the tomato juice has evaporated. Pour in vegetable broth. Bring to a boil. Add tortellini; cook 2 minutes or just until tender. Stir in bean salad and spinach. Cook 2 to 3 minutes to heat through. Season with additional salt and black pepper, as desired. Serve immediately, garnished with a dollop of pesto, if desired. Nutrition information per serving (1/6 of recipe): 360 calories; 10g protein; 33g carbohydrate; 22g fat; 650mg sodium; 15mg cholesterol; 7g dietary fiber; 6.87mg iron; 0.05mg thiamin; 5203.71IU vitamin A; 21.55mg vitamin C.
For dressing, combine hummus, lemon juice and za’tar seasoning; set aside. Add tomatoes, cucumber, onions, parsley, mint, garlic and red pepper flakes to bean salad. Toss to combine. Add dressing to salad just before serving; toss to combine well. Serve immediately or chilled. Note: For sandwich, spoon salad into pita halves. Nutrition information per serving (1/6 of recipe): 55 calories; 2g protein; 11g carbohydrate; less than 1g fat; 130mg sodium; 0mg cholesterol; 2g dietary fiber; 1.27mg iron; 0.03mg thiamin; 701.36IU vitamin A; 13.10mg vitamin C.
Makes 1 (approx. 1-1/4 cup) serving. Drain bean salad. Discard liquid. Place mozzarella in shallow serving bowl or dish. 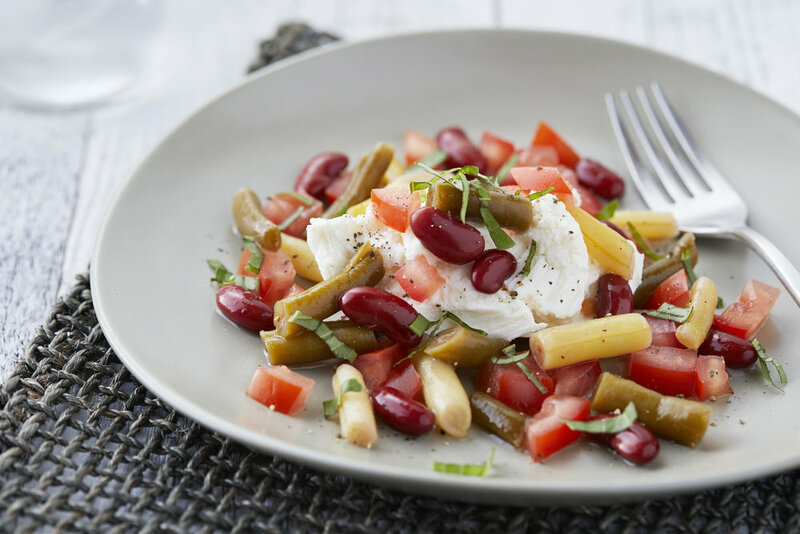 Top with bean salad. Sprinkle with tomatoes and basil. Add pepper and drizzle with balsamic vinegar, if desired. Nutrition information per serving: 160 calories; 7g protein; 19g carbohydrate; 5g fat; 420mg sodium; 20mg cholesterol; 4g dietary fiber; 1.37mg iron; 0.02mg thiamin; 854.42IU vitamin A; 67.12mg vitamin C.
1. Drain bean salad; reserve 2 tablespoons liquid. 2. To prepare dressing, in small bowl whisk together reserved liquid, lime juice, 1 tablespoon adobo sauce, mustard, salt and pepper. Whisk in oil until completely combined. Stir in cilantro; set aside. 3. In medium bowl, combine bean salad, quinoa, chicken, onions and minced chipotle pepper. Add dressing; toss gently. 4. Divide bean salad mixture equally among lettuce cups. Per serving (1/4 of recipe): 300 calories; 14 g protein; 28 g carbohydrate; 14 g fat; 390 mg sodium; 30 mg cholesterol; 4 g dietary fiber; 3 mg iron; 0.11 mg thiamin; 580 IU vitamin A; 7 mg vitamin C.